What is an instance of a database? 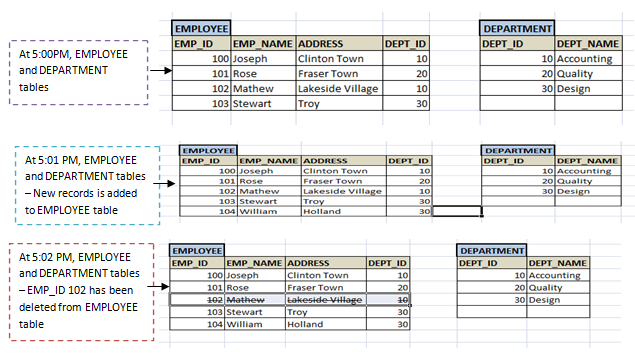 Imagine a database with EMPLOYEE and DEPARTMENT tables. Each of the table will have their own set of records. As there is addition of new employee, new employee record will be inserted into the table. When an employee moves out from the department his records will be updated or deleted. Similarly if there are any changes to the department, the respective details will be modified or deleted. Any new department details will be added to the DEPARTMENT table. Any point in time, there is a continuous change to the records in the database objects. There will be either increase or decrease in the number of records or there will be changes in the existing data. Any particular point in time, there would be one particular set of records exists in each of the objects, satisfying all the conditions of a database. This is called an instance of a database. i.e. ; at any particular point in time, what is the state of database with data values in its object is called database instance. It changes from time to time. Look at below snapshot of the database objects. It has EMPLOYEE and DEPARTMENT tables with their own set of data. It shows different values of object at different time. Each set of EMPLOYEE-DEPARTMENT data set represents instances of the database. Below are 3 instances of the database.